It's always a pleasure to write a review of a product that you totally love, and that's exactly what I'm doing today! After browsing the Kangaroo Care shop, I had a pretty good idea that I was going to like the necklace I chose, but I had no idea just how much I would end up loving it. The package arrived on Saturday(all the way from Estonia! ), and as soon as I opened it I was in love. The necklaces look pretty and fun on the website, but totally don't do justice to how nice they look in person! The necklace really is gorgeous- and I picked a boring black! You should check out all the other options in the Kangaroo Care story- Varja, the momma behind Kangaroo Care, is definitely not afraid of color, and there are some really fun color combos to choose from. I picked black because I needed a new black necklace, but I think next time I'm going to get one of the rainbow necklaces or another colorful one. I'm not a photographer, and my camera is crappy. You should definitely check out the great photos in the Kangaroo Care shop too. The necklaces are made to be worn while breastfeeding or babywearing(side note- I love the gorgeous nursing photos in her store! ), and while I couldn't really put the necklace to the test for those purposes, I can definitely see how it would be helpful for both. 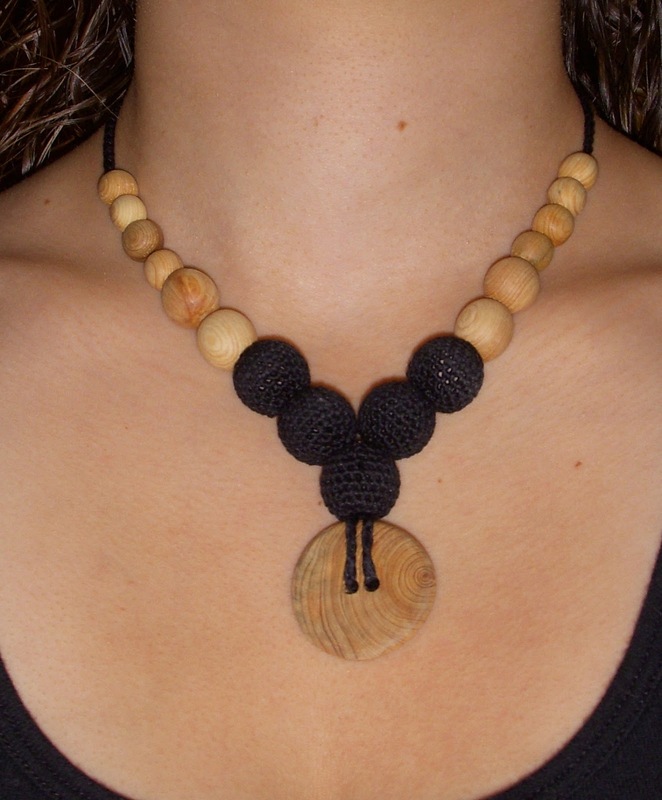 The necklaces, particularly the colorful ones, would easily catch a baby's eye, and the contrasting textures between the smooth wooden beads and the knitted beads could provide sensory stimulation for a baby, whether they were touching it or chewing on it. Heck- I'm an adult and I can barely stop touching it when I'm wearing it- it just feels so cool! Both of my kids have noticed it and wanted to touch and smell it. I was concerned that I wasn't going to like the fact that the necklace was on a string type foundation, or that you have to tie it in the back to wear it(I can be sensitive and picky with those kinds of things), but neither one of those things have bothered me at all. The necklace is actually really lightweight to wear, but not in a "this is really cheaply made" kind of way. I can barely feel that I'm wearing it when I have it on, which is always nice. I've only had it for a week, so I can't speak to durability, but the necklace seems like it's very well made and should hold up for quite a long time. I was so, so pleasantly surprised to discover that the necklace has a wonderful scent! (I should totally have read the description a little closer, because it tells you about the scent right on the item description.) The wooden beads are made out of juniper wood, which I had never smelled before, but the scent reminds me of cedar- it's like a light cedar-y scent. It's very refreshing, and I love getting little whiffs of it throughout the day. As you can tell, I totally love this necklace. I've had it for 7 days now, and I think I've worn it 5 out of those 7 days! It's so comfortable and goes with so many things in my closet. I've gotten several compliments on it too. My only complaint, and it's not even a complaint about the necklace, is that there are no earrings to match! I like to wear earrings to complete my look, and I would love to have a pair of super simple earrings to match my necklace. I can picture a small dangle earring with one of the smaller wooden balls and a knit ball below it, or even just a simple stud earring with one of the knit balls would look really nice and really help to complement the necklace. Although I suppose if baby's used to being able to grab at and pull on the necklace, you wouldn't want something encouraging them to pull on your ears! Maybe earrings would only be realistic for us mommas with older kiddos. Go check out Varja's shop, and make sure you like her page on Facebook too. She's got amazing products, and is very pleasant and friendly to work with! Thanks Varja! Disclosure: Everything shared in this post is my honest opinion of the product. 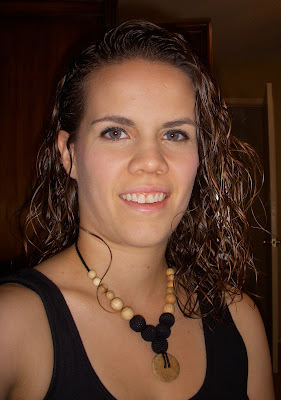 I was not paid to do this review, but I did receive the necklace for free.